Eiosis has just announced the E²Transienter, a new plug-in designed to bring a unique, simple and powerful approach to transient processing. The E²Transienter is based on a patented architecture and parameter combination, which allows detecting and processing transients independently. You can quickly get a wide range of settings, from simple attack enhancement, to complex mix adjustments thanks to the advanced parameters. The numerous included presets let you easily and immediately get the settings suited to your needs. You can then adjust the parameters to get exactly the sound you are searching for. 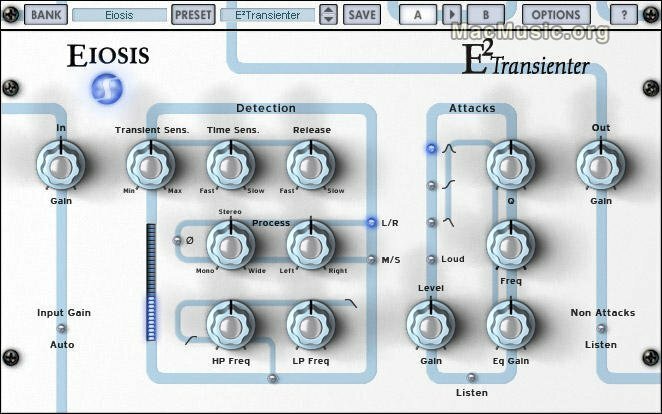 The E²Transienter will be available in May 2008 in the Eiosis online shop, in TDM/AU/RTAS formats for Mac (Pace iLok required) and VST/RTAS/AU formats for Mac and PC (Syncrosoft eLicenser required). Pricing has not yet been announced.